WASHINGTON — Newly-minted Italian Prime Minister Matteo Renzi, the youngest prime minister of Italy, is proposing a series of tax cuts to help stimulate a struggling Italian economy. Reuters reported that Italy, the euro zone’s third-largest economy, needs a shot-in-the-arm to jump start a slow economy. But, the Italian government is facing restrictions because it cannot exceed European Union budget deficit limits while enacting the tax cuts. Renzi said that he will reduce income taxes by 10 billion euros (or $14 billion) on an annual basis starting May 1st. The tax cuts focus on low- and middle-income workers. 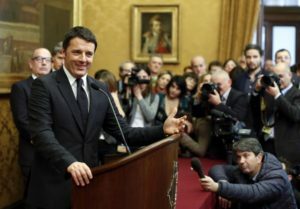 To make up for the tax cuts, Renzi plans on cutting government spending as well as borrowing additional money.